It's been more than twenty years since She Loves Me was last performed in the West End. This charming confection of a tale, penned by Harnick and Bock at the same time as they were writing Fiddler On The Roof, only had a short life on Broadway in 1963 although went on to enjoy award winning revivals on both sides of the pond in the 1990s. Drawn from Hungarian Miklos Laszlo's 1937 play Parfumerie (which in turn was to also inspire the Tom Hanks/Meg Ryan movie You've Got Mail) the plot revolves around an unlikely pair of star-crossed lonely hearts, who fall in love through an exchange of letters, whilst working side by side in the same perfume store and (initially at least) both blissfully unaware of who their paramour truly is. The story is as heart-warming as it is corny and in today's digital era, playing to a modern audience, it is barely more than a frothy fairy tale. Yet this production of She Loves Me is another example of London's fringe theatre at its very best. Robert McWhir is one of the few directors in town who can strip down a forgotten show from Broadway's golden era and with a talented cast, make it sparkle with sentiment, wit and fabulous melodies. Charlotte Jaconelli and John Sandberg play Georg and Amalia, the hapless lovers. Jaconelli a finalist on TV's Britain's Got Talent and already an accomplished recording artiste, makes a brave stage debut in a leading role with a performance that occasionally wobbles, but which will surely smooth out as she settles into the run. It is when Jaconelli sings though that this remarkable young woman defines herself as one of the leading voices of her generation. Her voice fills and thrills the compact Landor with amongst many songs, her Will He Like Me? being a particular treat. Sandberg carries the male lead with confidence and gusto. Half way through the second act, his treatment of the show's title song, with a cleared stage to himself, is a glorious demonstration of panache filled showmanship. Credit to casting director Benjamin Newsome, who has selected a cast of gems for McWhir to work with. In a key supporting role at the parfumerie Emily Lynne’s Ilona Ritter is a combination of flawless voice, movement and comic timing, with her two big numbers, Ilona and A Trip To The Library, both proving perfectly annunciated songs. Matthew Wellman is a definitive moustachioed love-rat Steven Kodaly, whilst Joshua LeClair’s Arpad, the delivery boy desperate for a job in the store itself, sheds the years brilliantly to play the keen teenager. McWhir also works wonders with the show’s outstanding ensemble. The close harmony work, occasionally sung a-cappella, is sensational with Rosie Ladkin and Annie Horn in particular maintaining a striking presence throughout. The comic highlight of the night however rests with Ian Dring doubling up as both the elderly Mr Maraczek the parfumerie’s owner and as a Waiter in a romantic nightspot of questionable repute, offering a bewigged performance of outrageous camp-ness suggesting Joel Grey crossed with Julian Clary. As ever, McWhir's creative crew are formidable. There is not too much dance in the show, but nonetheless Robbie O’Reilly’s work again shows how well her ideas partner the directors'. Ian Vince-Catt on keyboards conducts a stringed duet that give a finely reduced interpretation of Bock’s original score as David Shield’s designs seal the Hungarian illusion of the piece. His art nouveau painted backdrop and mini-trucks that whirl around the stage to create the store, a café and an apartment as well as exterior settings are inspired creations. A period piece for sure, but Harnick and Bock have written some fabulous songs and opportunities to see works this rare, performed this well, don’t come around often. 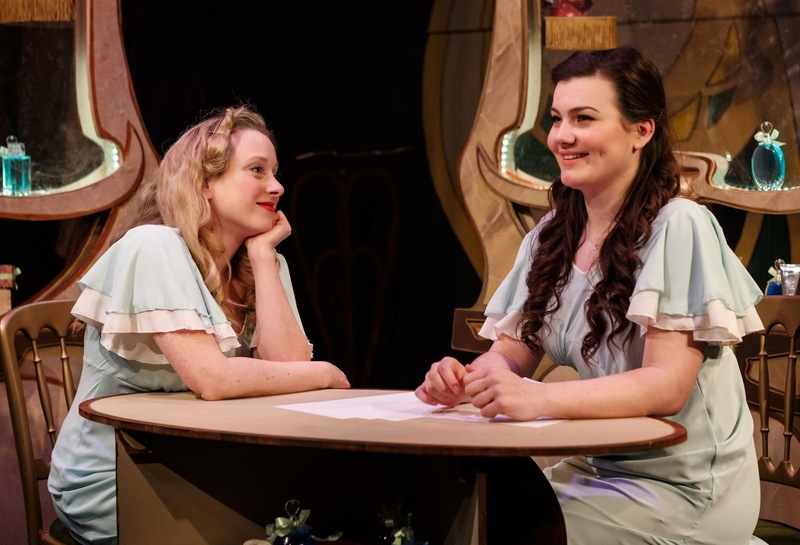 Like a tube of Maraczek’s eponymous beauty cream the production oozes romance and as Valentine’s Day approaches, there are few shows that match the fabulous feel-good factor of She Loves Me. Read my revealing interview with lyricist Sheldon Harnick here.